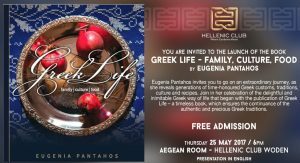 Canberra launch of Greek Life! 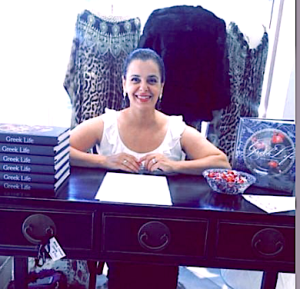 As some of you may remember, Greek Life was to be a private book written especially for my family and extended family. Then everything changed when I had the courage to say out loud that I had written a book. 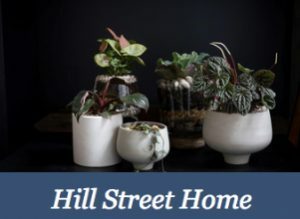 It was no longer locked away in the corners of my mind, or in a document on my laptop. 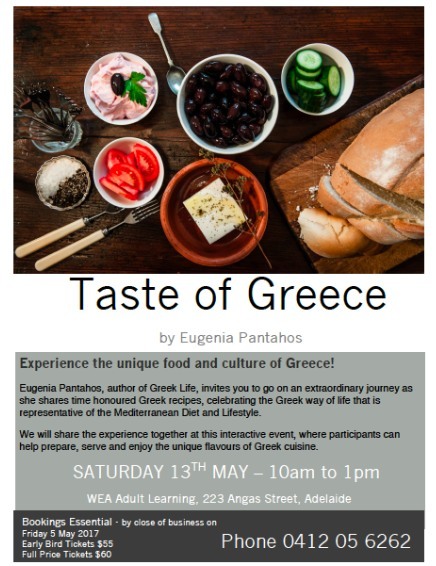 Bringing Greek Life to the lovely city of Canberra! 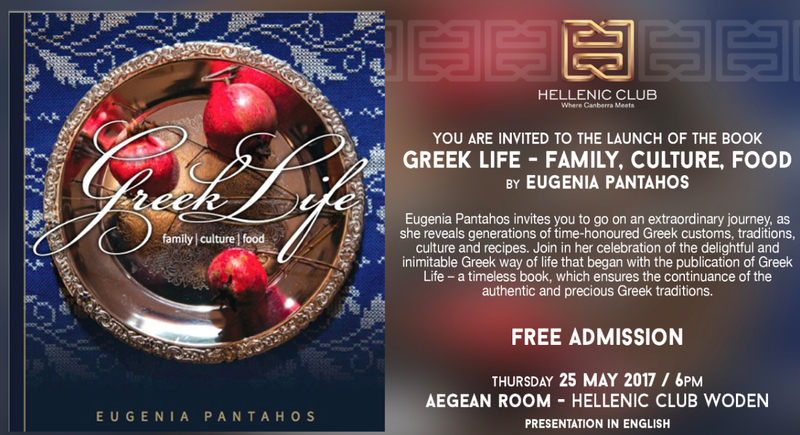 When I first embarked on the journey of bringing Greek Life to the public, I could only imagine some of the possibilities that lay ahead. I knew intimately that relationships are everything not just in our personal lives, but also in our professional lives. I’ve had so many wonderful people, too numerous to mention here, but nonetheless, these amazing individuals expanded my circle, introduced me to others who could open doors, and before I knew it, the community took notice, and I was book signing, being invited to give speeches, having a few gigs at being an MC, plus so much more. 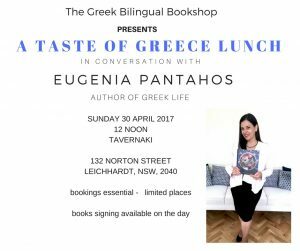 In May this year, I shared my story with the lovely people in Sydney at a Taste of Greece Lunch. It was a wonderful experience and I got to meet some amazing people, who came along to listen about how Greek Life came to be. We have all become friends, and share and like each others posts on social media. Together we are celebrating the new friendships and in this modern age, it means we can connect, and stay in touch, even from afar. 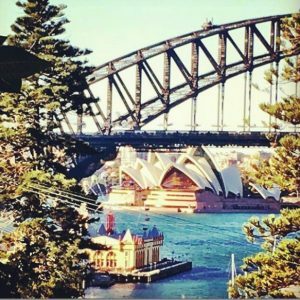 This month, I’m bringing the story of my book, and sharing the journey with the lovely folk in Canberra. 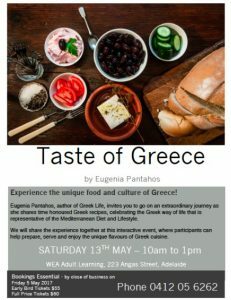 This event has been arranged with the Hellenic Club of Canberra, through a mutual contact from Sydney. I’m truly thrilled to be coming along to Canberra, and can’t wait to meet you all there! 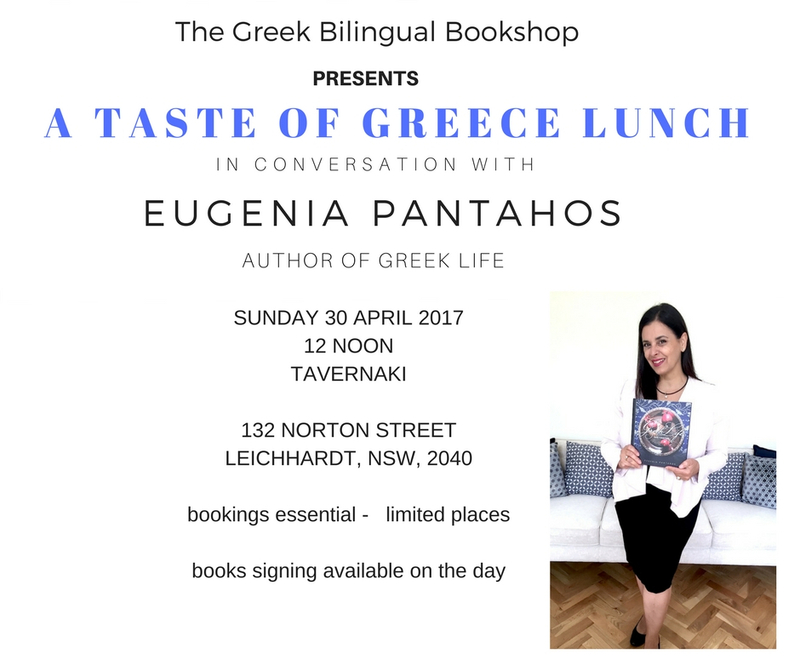 Don’t miss out on this opportunity to get your copies of the timeless book Greek Life, available exclusively in Canberra for this event. I’ll be signing books on the night too! 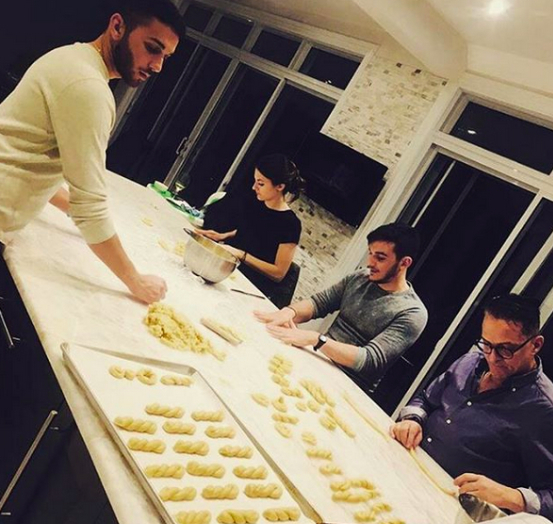 Please like and share this post. 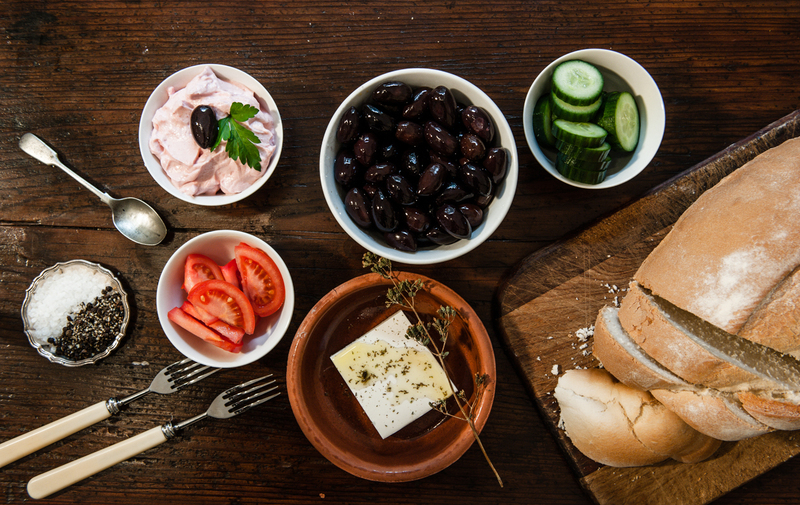 There is now limited stock of Greek Life, and I know you won’t want to miss out! In the Northern Hemisphere, Easter falls during the spring, and this is representative of renewal and rebirth. Much preparation and symbolism surrounds Easter from the celebration of Apokries (saying goodbye to meat), Clean Monday that is specifically observed with baking a traditional lagana (unleavened) bread, that hails the beginning of lent, and Holy Week when preparations for Easter begin. 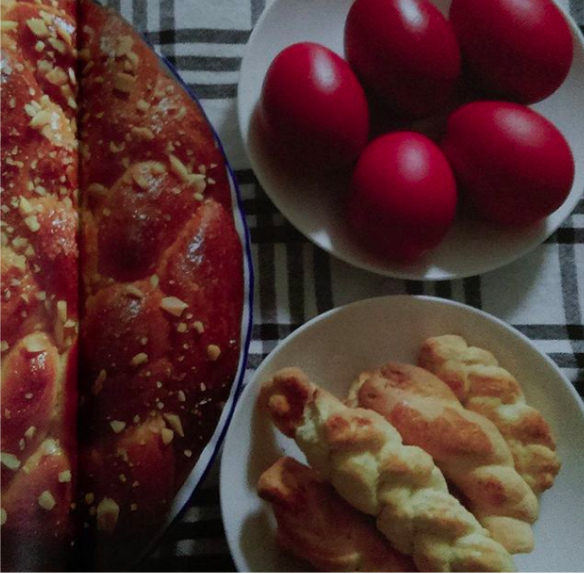 On Thursday, I’ll be making my koulourakia (butter biscuits), and on Saturday it will be time to prepare red dyed eggs, using our home grown and laid, free-range of course, followed by baking my Tsoureki, the delightful sweet, buttery and aromatic bread that is made especially at this time of the year. Tsoureki is infused with mahlepi (ground wild cherry) and Masticha (aromatic gum), permeating our home and fill the senses with anticipation of mouthwatering enjoyment.